Why tax bread, but not cigarettes? An $0.80 cent per pack cigarette tax dedicated to school facility maintenance will generate roughly $5M per year. Historic investment in school facility maintenance ($0.63/sf) is far below industry average ($3.00/sf). Only 8 of 43 schools have been constructed or fully renovated post-intentional segregation in school planning (1977-present). Every city in Virginia (page 3), besides Richmond, has a cigarette tax. An $0.80 per pack is expected to generate $5 million annually. 22% of Richmond adults smoke, which is the highest percentage in Virginia and almost double the national average (15.5%). Philip Morris pledged $1 billion to the fight against traditional burn-based smoking (cigarettes). Convenience stores main sales are from foodservice and beverages. Health costs equal $19.16 per pack of cigarettes, which increases financial and physical burdens on our city’s smokers. 1. Sign the support statement and take action! Endorsements by Richmond Free Press, Support Our Schools, American Heart Association, American Lung Association Virginia Chapter, VCU chapter of American Medical Student Association, and the following individuals: Mayor Stoney (if not used for bonding), Kenya Gibson, Amy Wentz, Camille Harris, Montigue Magruder, Ross Catrow, and Dr. Lornel Tompkins. Previous financial studies conducted by the BPOL Task Force and Davenport Multi-Year Investment Team recommended approval. 2. Share this poster and Facebook event to all the people! Five awesome points for each person who prints off copies and distributes them in a neighborhood gathering place. 3. Contact your City Council member before April 23rd. Go to the City website directory or click on our homepage image. 4. Show up to City Hall on April 23rd at 6pm to speak out in support. Go to our homepage or email us for more information. How much money will this generate? ORD2018-031 and its amendment to address legal concerns can be found on the City’s Legistar page. The projected revenue ($5M) and comparison to peer Virginia cities was provided by city staff. How does $0.80 compare to other cities? This national survey shows that $0.80 would be an average level for taxation, between Hampton ($0.85) and Norfolk ($0.75). Increasing cigarette taxes would also be in keeping with a national trend for local government. The cigarette tax was identified as sustainable, reliable, and locally available by the Davenport Multi-Year Investment Team (page 12). For a local comparison, the Town of Ashland collected an average of $301,333 the past six years with a $0.22 tax. Would this meet our school facility maintenance needs? No, but it's a good start and City Council hasn’t proposed any alternatives. There are 4.7M square feet (sf) of buildings in Richmond Public Schools. City Council appropriated an average of $9.5M or $2.02/sf the past three years (page 184). But, the historical backlog of needs would require approximately $18M or $3.83/sf over the next five years, with $31M requested for the upcoming fiscal year (page 186). The industry average is between $1.00/sf and $4.00/sf depending on age and condition. With a deplorable stock of infrastructure, I’ve received feedback from industry professionals that $3.00/sf should be a minimum standard. Mayor Stoney’s proposed budget $1.5M or $0.32/sf for the upcoming year (page 9) and an average $2.6M or $0.55/sf per year (page 12). A start, but nowhere even close! City Council budget amendments come out next week and from what I’ve heard, there are no alternatives proposed. Hey, I heard we have money we haven’t spent on facility maintenance!?!? Yes we do! $2.6M left unspent from last year’s allocation for facility maintenance. From the RPS Finance, the specific breakdown of this $2.6M, as well as money still remaining for ADA compliance ($3.2M) and new school construction ($13.7M), can be seen here. Because its Richmond, these numbers do not match the City’s Finance balance sheet which shows $9M remaining for new construction and either $13M or $6 (if FY17 expenditures are included) for school maintenance. Either way, if we have millions of dollars left over and a pile of needs it needs to be spent! C’mon RPS. I understand that we need savings in case of an emergency, but it shouldn’t be taken from an operating budget. Here’s your 16 page list of RPS maintenance needs, as long as an Applebee’s menu. School safety is a HUGE CONCERN, so let’s get new intruder locks at Armstrong, Wythe, and Thomas Jefferson (600k). Leaky classrooms? How about fixing the roofing at Carver, Fox, Chimborazo, Westover, and Redd ($3.45M). For kicks, let's also fund all FY19 electrical needs (400k) and put a new track and football field at Armstrong (600k). Information from the Richmond Health Department shows that 22% of Richmond adults smoke, which is the highest percentage in Virginia and almost double the national average (15.5%). Non-smoking tobacco users account for 24% of Richmond adults. According to the American Heart Association, each day (nationally) 2,500 kids try their first cigarette and in Richmond, 27% of high school and 22% of middle school students have tried smoking. Yes, national smoking has declined from 20.9% (nearly 21 of every 100 adults) in 2005 to 15.5% (more than 15 of every 100 adults) in 2016. Industry leaders are coming to grips with the health impact, and have been funding campaigns to quit (and vape). In 2017, Philip Morris pledged $1 billion to the fight against traditional burn-based smoking. Now you may be thinking, isn’t it self defeating to set a tax that could disappear if people stop smoking. You are correct, those revenues would go away, but that future utopia is far from current reality. What is the cost to smokers (and society)? In the long term, raising pricing on cigarettes could actually lower the net cost to smokers. By paying an extra $0.80 on a $4.00 pack of cigarettes, you are still below the $19.16 health care cost per pack of cigarettes. Not only do cigarettes increase financial and physical burdens on smokers, but with only 18% of Richmond smokers with health care insurance, greater society will bear health care costs through government subsidies or health insurance premiums. Altria is a hometown business who is the largest real estate holder in Richmond and invests millions in local projects to support education and the arts. They oppose the tax more as an emotional affront, more than a rational approach. They point to Petersburg’s recent tax where collected revenues did not meet what was proposed. Their paid representatives haven’t threatened leaving Richmond, but this is a common talking point from “non-official” supporters. It’s impossible to address the emotional affront, so lets start with the numbers. This in no way will impact Altria’s profit model. With the growth of cigarettes internationally and non-burn tobacco nationally, revenues from just one city, Richmond, are a non-factor. For the one example of Petersburg they consistently tout, its low collection is in keeping with historic collection rates. For example, Newport News, saw an initial dip in taxes collected, but rebounded and in 2015 generated over $4M from an $0.85 tax. Threatening that Altria will leave would be a petty move and against all business research on why corporations select to locate. Workforce composition is the central driver for future site selection, and that talented workforce is here. They have too much invested in infrastructure and business relocation will not be based on a local tax that has no direct impact on their economic model. The cigarette tax is not consistent or reliable as a source of revenue. Not true. In the past 6 years, revenues collected from cigarette taxes (see page 2) in Ashland have declined, but at a linear and predictable rate. Consistent with Mayor Stoney’s support for this tax, it shouldn’t be used for bonding but can be a cash generator to deal with a backlog of unmet facility needs. The cigarette tax will put small convenience stores out of business, especially where walking into Henrico or Chesterfield is an option for customers. It's not highly likely, but this may happen. Research from Convenience Store Decisions, says that foodservice accounted for the largest source for profit in 2015 (33.7%), with beverages as second (18.8%). Although tobacco product sales constituted 35.9% of in-store sales, they accounted for only 16.8% of profit. The same argument was made by restaurant owners for the meals tax, and similar to buying food, people buy cigarettes where it is easiest. Thin profit margins are a reality in both restaurants and convenience stores. If we can tax bread, why can we not tax cigarettes? The cigarette tax is regressive in that lower income and lower education people, the predominant demographic of smokers, will bear the burden. Richmond Health Department data does confirm that smokers in Richmond have less income and lower educational attainment. Racially, it’s a relatively even split between White and Black smokers, with Latino smokers being so low as not to register. Taxation, if it lowers smoking rates, could be a financial gain for the lower-income smoker (see $19.16 health care cost per pack). Similar to the argument on lower-income restaurant owners and workers, this is a choice between two inconveniences. 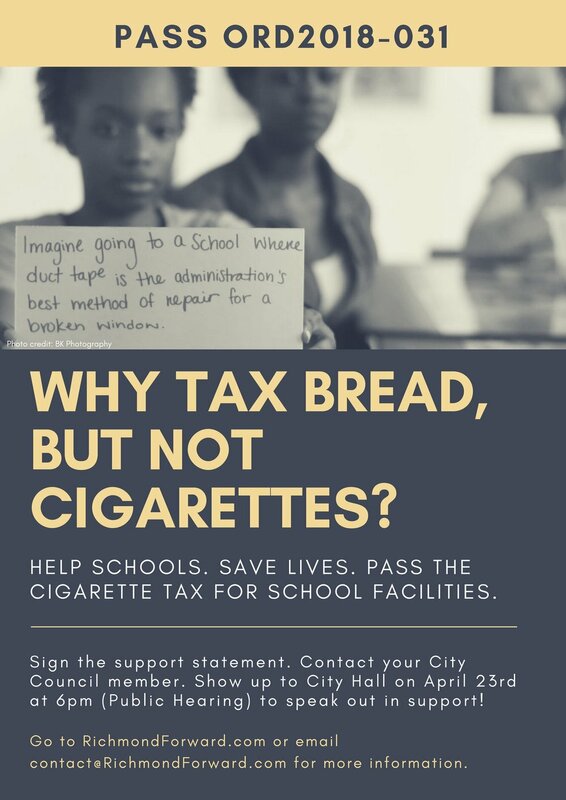 An $0.80 burden on adults buying cigarettes or children going to an unsafe school. I’ll choose to address the latter. Improving the function of government within our current budget, similar to this example of streamlining development review, is 110% needed. We desperately need a more efficient system. Mayor Stoney has begun this work, and more action is needed by the School Board and City Council to tighten the belt. With that said, its a real balance. My hope in supporting new revenues like the cigarette and meals is that we can get these in place AND fight for efficient use of dollars. The need is so monumental that we can tie down/direct new dollars ($150M new facilities and $5M maintenance) to clear emergency needs. His impressive road show consisted of the following: Richmond Free Press, WTVR6, NBC12, RVA Dirt’s Municipal Mania, NPR’s Full Disclosure, Gary Flowers Radio Show, Richmond-Times-Dispatch, and Style Weekly. Larson and Hilbert have expressed past support for a cigarette tax and Addison has expressed interest as a quality health policy. Jones seemed like he was in support with comments during meals tax, but at March’s Finance Committee (and comments made on Cheats Movement) he’s leaning “no” to support Reva and in fear of Altria. Newbille taped her community meeting and comments can be seen here. Robertson and Gray have expressed interest, but have concerns about impact to lower-income residents, small businesses, and inefficiencies with the School Board. She is a hard no on this. If you and I agree that Richmond children are deserving of the same benefits of children attending county schools, then we must forcefully and diligently pursue equity. The lesson from civil right history is that those pursuing equity must bear the burden. That’s why I keep asking myself and others, what sacrifice will be required to achieve an equitable outcome for city students? To break the wheel set in place by white supremacy, it's going to be a messy and we will bear the brunt of sacrifice. In a PERFECT world, culpable institutions of the state, region, and big business would help, but we cannot wait. If our students, parents, teachers, and staff are making the daily sacrifice to attend these crumbling facilities, we must ask for our share of the burden. We must fight tooth-and-nail for every new dollar through non-essential service cuts or raising taxes on those of us with economic means. Anything short in this fight will leave us with the unacceptable status quo, that perpetuates the dreams of our white supremacist forbearers. It’s time to fight for every penny by passing a cigarette tax. Let’s go! Cigarette Tax: Enough Puff, Now Pass!